The APS guys knocked out 300,000 sq ft last weekend and striped it under very windy conditions. Asphalt sealcoating is one of the most important elements for Property Management owners in charge of maintaining asphalt parking lots. Applied in two thin coats, pavement sealing is used to protect off-highway pavement surfaces against gasoline, oil, salt, water, and ultraviolet rays. 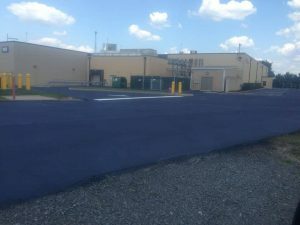 Asphalt Pavement Solutions is the Philadelphia / Camden asphalt sealcoating expert, serving New Jersey, Pennsylvania and Delaware.